Newly launched cryptoasset exchange, ErisX, has reportedly raised $27.5 million from major institutional investors including Nasdaq Ventures and Fidelity Investments. According to ErisX’s management team, the new exchange will support bitcoin (BTC), litecoin (LTC), and ether (ETH) trading on spot and it will also list crypto futures contracts beginning next year. At present, ErisX is reportedly waiting for regulatory approval, before moving forward with these plans. Representatives from Nasdaq confirmed that the exchange operator had taken part in the investment round, however, they did not disclose how much the company had invested. Meanwhile, Fidelity has also not provided details yet regarding its investment in ErisX. The multi-million dollar investment will be used to recruit new staff and “build out infrastructure and [ensure that] the appropriate steps are taken to develop a regulated market for digital assets,” Thomas Chippas, the CEO at ErisX, told Reuters. ErisX, a Chicago-based firm, had closed on a first round of investment in October, which was led by Cboe Global Markets Inc, giant retail brokerage firm TD Ameritrade Holding Corporation, and private equity firm, Valor Equity Partners. Despite the extended crypto bear market this year, many firms have been making sizable investments in the blockchain and digital assets industry. In a recent interview with TheBlock, Ari Paul, the co-founder of crypto fund BlockTower Capital, revealed some noteworthy investment and business strategies that companies have adopted - in order to survive the rough market. Paul added: “It is hard to grow a strong business in a bull market because you aren’t forced to make tough decisions. Tough decisions leads to better allocations.” Paul also noted that BlockTower Capital was looking to hire two more staff members to round up its investment advisory team. While some firms are planning to expand their operations, with digital asset exchange, Binance, CEO Changpeng Zhao disclosing recently that his company is close to launching its proprietary decentralized exchange (DEX) blockchain (called Binancechain), there are many crypto firms that have shut down recently. As is publicly known, we have struggled with funding our operations in the last few weeks. 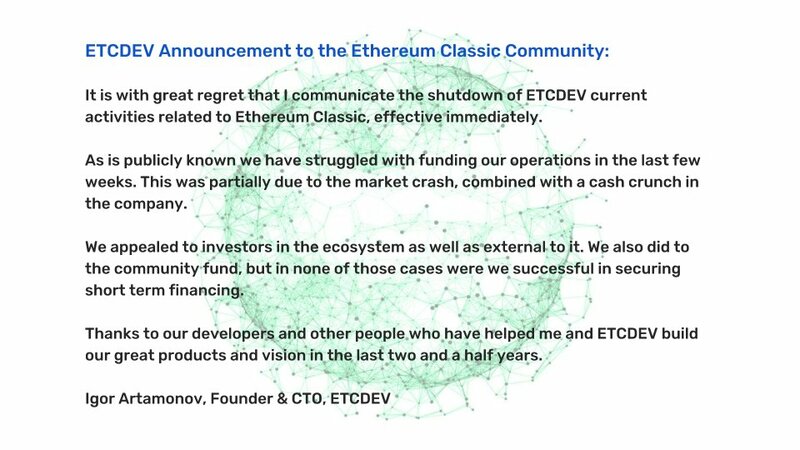 This was partially due to the [crypto] market crash, combined with a cash crunch in the company. We appealed to investors in the ecosystem as well as external to it. We also did the community fund, but in none of those cases were we successful in securing short-term financing.